Hello all you amazing people out there in the Whaleshares community, I hope you are doing great. We have another Promote Your Post show coming up later on in the Whaleshares Discord server so it's time to get your posts ready and make sure you're in curation mode. Your host of course is the very adept and profoundly lovely person we know as @breezin. The show provides a great opportunity for you guys to come and grab some extra upshares and rewards for one of your posts. The Promote Your Post show is sponsored by my new token Whalecoin. 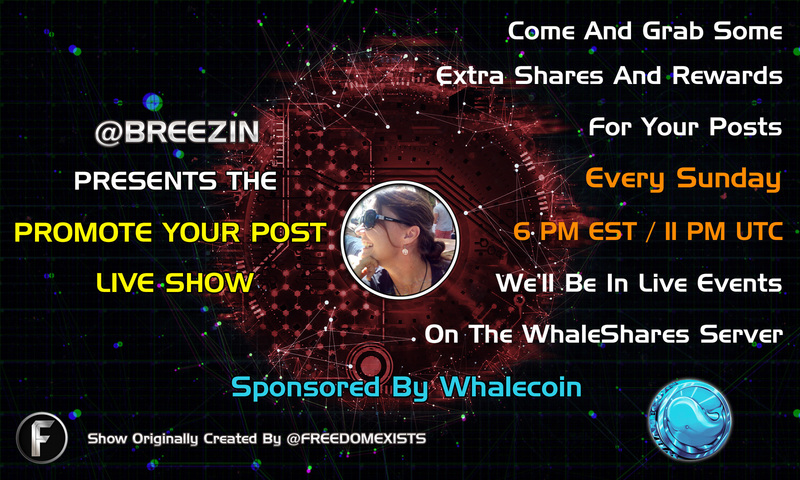 I will be giving away Whalecoins for all of you that come to the show and present a post. Whalecoins can be used to boost the value and prominence of your post, helping you get not just an extra payout but also a nudge up the trending scale on Whaleshares. Please note that you will need to present your post in English and you will need to make sure your microphone is functioning correctly. We have an Hispanic promotion show on Friday nights hosted by @chuckyfucky and @bryangav. If you're not familiar with how Whale Tokens work and how they can help you on your Whaleshares journey please visit the Whaleshares information website and you can learn lots about Whale Tokens there. The website is https://whaleshares.info. We start the party at 6pm EST or 11pm UTC and you can find us in the Official Whaleshares server on Discord, we'll be revelling it up in Live Events. A link to the Whaleshares server is here - https://discord.gg/3pqBXKY. So if you're looking for a warm and friendly place with a positive vibe so you can grab some extra upshares and rewards for one of your posts, if you like meeting inspiring people, and if you want to get some extra followers and create new relationships then you should come along.